His recent divorce and the subsequent new relationship may be common fodder for Australia’s weekly gossip magazines, however, Karl Stefanovic appears to have had enough. 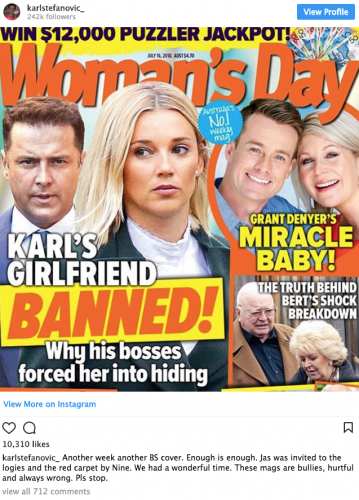 Yesterday’s edition of Woman’s Day reported that Nine bosses had deliberately kept Stefanovic and his new fiancee Jasmine Yarbrough apart at the Logies two Sundays ago. According to the article, Stefanovic was made to walk the red carpet with Today co-host Georgie Gardner in an attempt to show a united front. Today’s ratings have been tumbling and it’s widely thought Stefanovic’s marital problems have been a big turnoff for female viewers who are deserting to rival Sunrise. An “insider” telling the magazine: “They told him in no uncertain terms that it wasn’t a good look to bring Jasmine to the event and banned her from the red carpet. 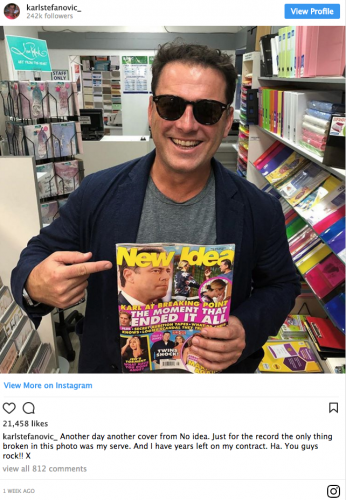 Yesterday, Stefanovic took to Instagram to slam the Bauer-owned publication. “Another week another BS cover. Enough is enough,” Stefanovic wrote next to a picture of the Woman’s Day cover. Last week the 43-year-old Stefanovic lashed rival title New Idea that had him on its cover next to the coverline “Karl at breaking point”. It’s been a tough six months for Stefanovic who, back in March, was recorded having a drunk conversation with brother Peter in the back of an Uber were he repeatedly berated the skillset of many of his colleagues at Nine. Again, it was the Seven-owned New Idea who paid $50,000 for the transcript which revealed, among other things, that both brothers felt Nine’s management was “out of touch”.